Stanley Roberts is well known for his “People Behaving Badly” segments on KRON4. 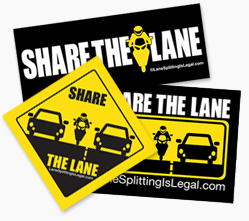 He recently did a segment on lane splitting, in which he answers the question “So why is this a People Behaving Badly segment, if no one is actually behaving badly?” while riding in a CHP cruiser. The bad behavior, in this case, is splitting too fast or otherwise unsafely, but he also calls out impeding or blocking motorcyclists as bad – and illegal – behavior.